So I preface this, as I do all of my Woody Allen reviews, with a statement of assured objectivity. Yes, I am a self-proclaimed Woody Allen fan, but I am not above delivering a negative review to projects that are worthy of one. It just so happens that there are few projects of Allen’s without redeeming quality. The trend continues with Café Society, Allen’s 41st film he has written, directed, and released within a year of his previous film. In his 81st year of life, the director shows no sign of slowing down. His new deal with Amazon may be a catalyst, as Café Society is his first to be produced by the Internet giant, and it is his best film since 2013’s Blue Jasmine. It also arrives on the heels of his new Amazon produced television series, Crisis in Six Scenes, premiering this fall. Who would think the hardest working man in show-business would be 80? Like every good Woody Allen movie, familiar plotting must be countered with memorable and well-designed characters. The lavishness of the Stern life is beautifully contrasted with the working class Dorfmans. Rose’s daughter Evelyn (Sari Lennick) maintains a middle class life with her philosopher husband Leonard (Stephen Kunken), and her oldest son Ben (Corey Stoll) quietly runs a pretty active mob syndicate (Bullets Over Broadway-style) unbeknownst to the rest of his family; his scenes are outstanding. That just leaves Bobby as the lost soul looking for his slice of happiness, and he quickly finds it in the form of Vonnie (Kirstin Stewart), his Uncle Phil’s beautiful assistant. Bobby falls for Vonnie at first sight and his advances towards her do not go unnoticed, although Bobby does have competition as Vonnie has a boyfriend. What follows is a more or less traditional exploration of whether all is truly fair in love and war but with some twists along the way. The predictability is nicely offset by the solid performances. Look out for Blake Lively in a small role later in the film that channels Diane Keaton in Annie Hall. Performances aside, Allen has also made a visually gorgeous film with some beautiful scenery. Café Society marks Allen’s first digitally shot film, and he makes good use of the technology capturing some vintage Allenesque shots but with a new vibrant quality. Café Society is rated PG-13 and has a running time of 1 hour and 36 minutes. Na-na na-na na-na na-na… ANT-MAN? You read that right. 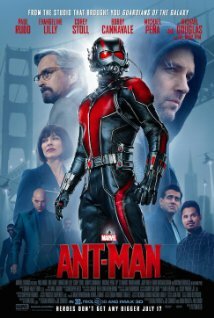 Stan Lee’s 1962 comic book character, Ant-Man gets the Marvel cinematic treatment with Paul Rudd as the microscopic maverick. This film concludes Marvel’s “Phase Two” that started with Iron Man 3 back in 2013. Rumblings of an Ant-Man movie date back at least fifteen years when radio personality Howard Stern claimed that he tried to buy the rights to the character. By 2003, British director Edgar Wright pitched an Ant-Man film to Marvel that was in perpetual development for eleven years before “creative differences” between Wright and Marvel’s parent company Disney eventually resulted in Wright’s departure. Director Payton Reed would step in to finish the project, and while production was troubled and buzz was non-existent, Ant-Man, like its namesake, is stronger than it looks. As I mentioned, Paul Rudd plays Ant-Man and his alter ego, Scott Lang. Rudd also serves as a co-screenwriter on the film, making him the first star of a Marvel film to serve as both lead actor and screenwriter. The film opens in 1989 where a furious Dr. Hank Pym (Michael Douglas) argues in front of S.H.I.E.L.D. (including Agent Peggy Carter, played by Hayley Atwell) that his breakthrough on reducing the distance between atoms, nicknamed the Pym Particle, is too dangerous to hand over to them. Fast forward 26 years and Pym has been effectively voted out of control of his own company by his own apprentice, Darren Cross (Corey Stoll). Cross has been working on recreating the Pym Particle and appears to be on the cusp of doing so, the consequences of which worry Pym. Don’t shrink me, Mr. Cross! 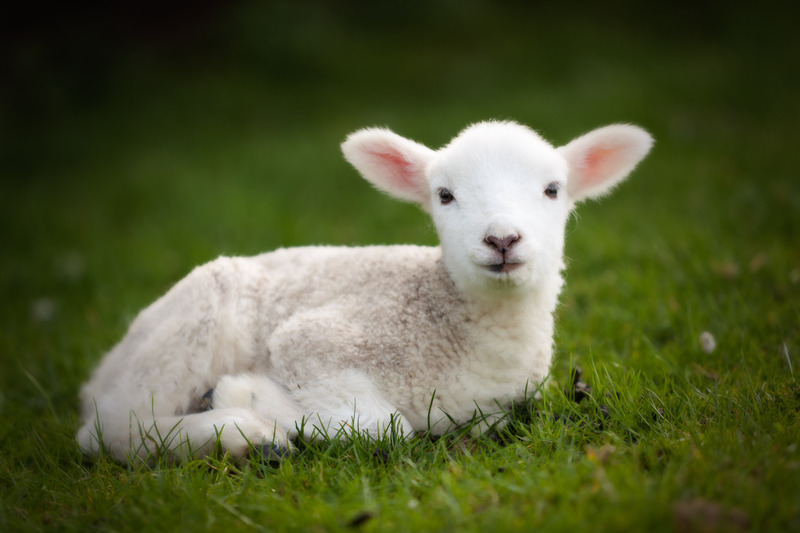 Cross is a bad dude, and if you weren’t sure…there’s a scene where he evaporates a cute, little lamb in his testing trials to shrink organic matter. But this film is not called Lamb Man, so I’ll move on. It turns out Lang, an electrical engineer, caught the attention of Pym when he was arrested for “burgling” his employer, a cyber-security conglomerate, because they were overcharging their customers. After serving three years in San Quentin, Lang was released and Pym, in a rather unorthodox[*] fashion, recruits Lang to wear a secret particle suit that would allow him to shrink to the size of an ant in a plot to overthrow Cross. Lang’s place in the conflict between Pym and Cross does seem artificial at first. Enter Cassie (Abby Ryder Fortson), Lang’s six-year-old daughter. Lang’s main motivation is to be a man Cassie can be proud of, and Pym is offering him a chance to do just that. It also doesn’t hurt that Pym’s beautiful daughter Hope (Evangeline Lilly) is assigned to work closely with Lang in his training. And there is a lot of training. Not only does the Ant-Man suit allow Lang to shrink in size, but he retains human strength in his miniature form. Pym also provides Lang with a neurotransmitter that allows him to communicate with actual ants making him the weirdest movie superhero to date, in my opinion. However, weirdness works in the case of Ant-Man, mostly because of Paul Rudd. Rudd has been slowly “breaking out” over the past 20 years. His everyman approach and his bravado sense of humor make him impossible not to root for, which is precisely why he is effective as a superhero. Like all of the best Marvel films, this one is not just a superhero film, but it is a genre film as well. Ant-Man plays out like a “caper,” complete with safe cracking, data stealing, and elaborate breaking and entering schemes. There’s even a sort of Ocean’s 11 vibe when Lang recruits has band of misfits including Michael Peña, David Dastmalchian, and T.I. to help with a big heist. Ant-Man is rated PG-13 and has a running time of 1 hour and 57 minutes. Unlike Avengers: Age of Ultron, this film does have additional scenes after the film. There is one about a minute into the credits and another after the credits. This is Where I Leave You is one of those movies that feels like it would have been better off as a television series rather than a movie. First of all, there are simply too many characters to develop over the running time of a feature film, resulting in a film that feels very shallow. Secondly, it just so happens that every featured actor in the film, minus Jane Fonda, earned a reputation as a television actor. The high profile cast is certainly the story with this film, but when you take that out of consideration, there is not much left over to get excited about. Jason Bateman plays Judd Altman, a radio talk show producer who gets a one-two punch from life when he discovers that for the last year, his wife has been sleeping with his boss and then that his father has suddenly died. Judd’s mother Hillary (Jane Fonda) tells him that his Atheist father’s dying wish was that his wife and four children sit Shiva, a Jewish mourning tradition where immediate family of the deceased spend a week at home all together receiving visitors. This becomes the impetus for the rest of the film. For the first time in years, Judd now finds himself face to face with his uptight older brother Paul (Corey Stoll), his careless younger brother Phillip (Adam Driver), his sassy sister Wendy (Tina Fey) and of course his over-sharing mother Hillary. Fonda does get to have fun in her role as a mother who cares about her kids but not enough to not expose all sorts of embarrassing details from their lives in her best selling guide to raising children. With all of this talent assembled, it’s a shame that most of what follows is one cliché after another. Timothy Olyphant does manage to evoke some real heart with his role as Horry, a brain injured neighbor and ex-boyfriend of Wendy’s. His scenes and those about him are the truest and strongest in the film even though he is a very minor character. In contrast, the budding relationship between Judd and a former high school squeeze, Penny Moore (Rose Byrne) becomes the focal point of the film and yet feels deeply artificial. This is Where I Leave You is rated R and has a running time of 1 hour and 43 minutes.